Yourtes disponibles 4 saisons avec terrasse, foyer et baignoires en option! La Yourte ou «Ger» est une structure mongole, comparable à un Tipi Premières Nations. Utilisé par les peuples nomades, il a été initialement faite de feutre et fourrures. Après avoir été occidentalisé par des habitants de l'Oregon et de la Colombie-Britannique, la yourte a été transformée. Peints à la main du plafond au sol, nos yourtes mongoles mesurent 16,5 à 19 pieds de diamètre et possèdent leur propre pont. Les caractéristiques intérieures, isolés confortables lits confortables, une prise électrique et un puits de lumière. Salle de bain / douche disponibles à une courte distance. Des baignoires en cèdre japonais sont disponibles moyennant un supplément, à côté des yourtes. Certaines offrent une vue imprenable sur l'océan Atlantique, les îles Bird et notre bassin en eau douce. Peut accueillir confortablement 2 à 5 personnes, en fonction de la yourte choisie. La plupart d'entre eux sont également les animaux de compagnie! Yourte en cèdre - cette yourte est différente et fabriquée en bois de cèdre avec un lit Queen, des lits superposés (2 lits jumeaux), de l'électricité, un poêle à bois, une terrasse privée et les animaux domestiques. Toutes les yourtes n’ont pas de salle de bain à l’intérieur, mais elles sont situées à proximité de salles de bain ou de douches. Les salles de bains une courte distance à partir de chaque yourte - WC, lavabo, douche. Beautiful, peaceful space surrounded by ocean and friendly people! My husband had I spent a week here on our honeymoon and we didn't want to leave. We stayed in the little blue yurt which overlooked the ocean and every morning we woke to the sunrise and had breakfast in the lodge. Everyone we met was wonderful, friendly and extremely accommodating. The food was delicious and the music was excellent. Drinks were good too! We felt like we didn't have to go anywhere else for the whole week. We kayaked, had a fire on the beach, used the hot tubs and relaxed. We will definitely come back for an anniversary trip! Wonderful having the Bishops for a summer stay in the little blue yurt. They are a delightful couple and, as they said, took full advantage of ocean views, kayaking, the Eagle Feather beach, hot tubs, live concert and great food. The secret to success at Cabot Shores, for guests and staff alike, is to participate in what this wonderful spot offers in terms of outdoor and cultural adventure along the Cabot Trail and the Atlantic. Looking forward to having you again here anytime soon! 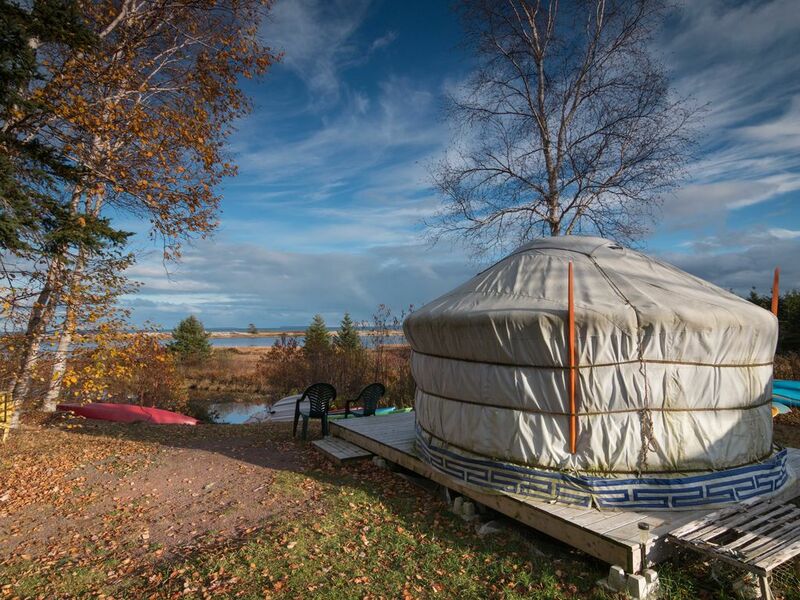 Staying in the yurt was the highlight of our trip to NovaScotia. Do to cancelations we got up graded to a bigger yurt which was more private and had its own outdoor hot tub. Soaking in the hot tub on a cool fall night under the stars was the therapy we needed after a long day. The food at the main chalet is not to be missed! Although it's a small selection every dish we had was one of our bests meals and knowing that most of it came from the garden on the property is the tipping on the cake. This will for sure become a staple for all our future Nova Scotia trips. It was our first time staying at a yurt! Kids had a great time! So did the parents. I loved the morning meditation session. I give it 4 stars because upon booking I was told our yurt will accommodate 5 (2 adults 3 children) but when we were taken to our yurt there was only one bed inside. Staff had to bring in extra sleeping mats, which was fun to sleep on for the kids. Also, wished there was a bit more offered for breakfast. Although it was very tasty, a bit expensive for the variety offered. It was fun to stay in the yurt! The yurt was comfortable and private. We enjoyed eating at the Bistro, as well. The food was delicious and the staff was courteous, friendly, and helpful. We watched the stars through the skylight as we fell asleep. The staff also gave us good recommendations for area hiking. We would go there again. We enjoyed our stay at Cabot Shores. The yurt was a good new experience. There were lots of mosquitoes the first night but we found a hole in the screen and covered it and the next night was bug free! Friendly staff and very scenic area! Perfect place to relax and disconnect!!! We were looking for something fun and relaxing to ring in the new year and we were not dissapointed! We had the opportunity to spend one night in a cabin and one night in a Yurt and you can`t go wrong with either! When life gets busy it is a perfect place to unplug (no cell service was a real bonus!). Dr. Paul and the staff where very helpful and always there if you need them, but not intrusive in any way! They even convinced us to join them for a polar bear swim....so much fun! I can say with 100% certainty that we will be back and we will (and have been) telling everyone about it! Comme nous sommes du côté de l’océan de la Piste Cabot, il y a de belles promenades et randonnées à proximité, dont certaines aux cascades qui commencent sur la propriété. Aussi, vous êtes sur la boucle des artisans avec beaucoup de petites boutiques vendant du cuir, du fer, du verre, des bijoux, de la poterie et plus. Please note that our prices are in Canadian dollars; we rent our yurt $165 plus tax per night each.